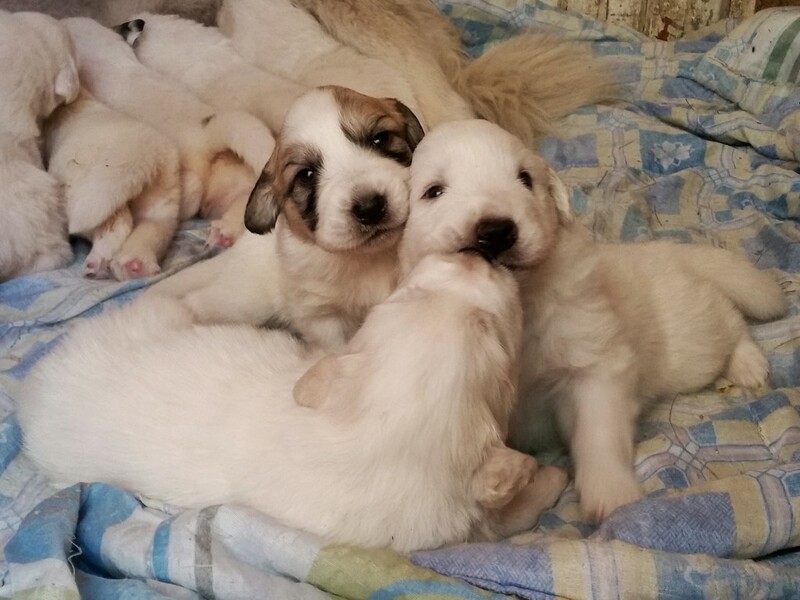 Pyranean Mountain Dog (also known as Great Pyrenees) puppies. These guys are almost 3 weeks old and are starting to get active. I love the mask that this little one has. Interestingly the puppies that have the mask also have a dark stripe on their tail. How adorable are they. Sweet shot Sally. stop it, sally! they're so cute i want to have one. if i wasn't afraid they'd grow. :-) methinks i'm going to the toy store and get one. wonderful shot of the little cuties. Oh my goodness! These puppies are the cutest! This is my kind of dog -- I love how these tiny sweet puppies become those huge affectionate dogs. I so miss having a day in our home -- we borrow our neighbor's dog frequently, but it's a tiny little thing of 15 pounds so doesn't have the same presence. Do you have the mom? @taffy The mom belongs to one of my clients. I groom her on a regular basis. The family have 3 Pyraneans, I groomed the two males today and will groom this mum in two weeks time. Should get some pictures of the pups walking, playing etc. At the moment they are not quite walking although they manage to get all around the welping box! @summerfield lol, some of the adult dogs that I groom are the same size and weight as these 3 week old babies! The dad weighs 52kg! What a gorgeous set of puppies! Far too much cuteness in one photo! Wonderful image. oh my word!! so cute!! are these your babies? 8 little bundles of gorgeousness! @brigette thankfully not Brigitte! They belong to a client of mine. @dibzgreasley Debs, there's actually 9 of them, I just couldn't get them all in together! @salza Oh my word, poor mum! Aw, they are so cute. Poor Mum with 9 babies to look after. So cute and they will be growing to be huge dogs!! What a handful!! Oh my word. The cuteness is out of the this world. Aww, so much cute puppyness! I thought there were 8, but I read that there are 9. Poor mommy dog...she certainly has her paws full. Omg, I'm seriously in love! What cuties! They are so cute!!! If they were next door my resolve to not own a dog would be sorely tested! (It's not that I don't like them- I just have no way to care for them when I travel). Oh these puppies are so melty...just like my heart! Beautiful and hard to count. The one in front is so white I didn't notice him/her at first. This is so incredibly cute, can't stop looking at the picture!!! Oh so cute! I think I've totally fallen in love! Adorable! I want to cuddle them!